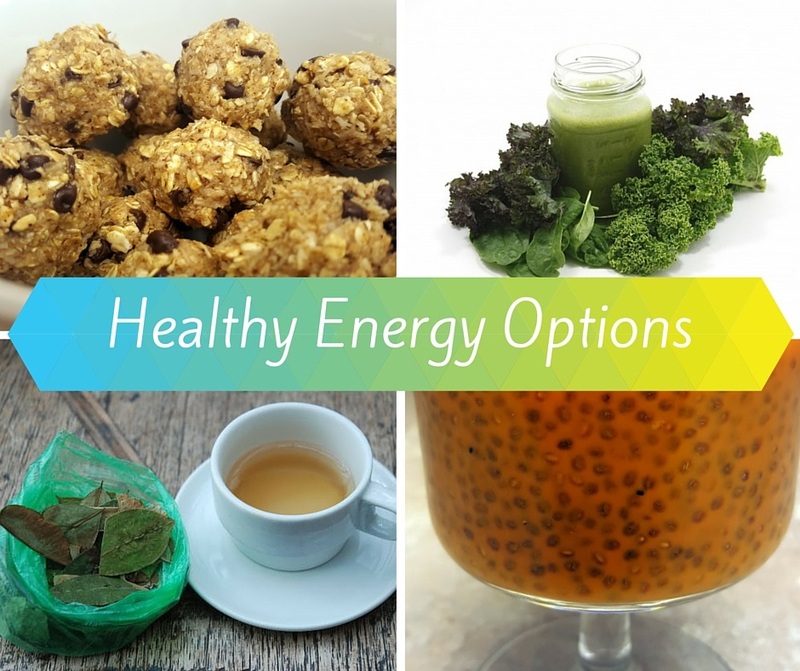 Last week I shared some of the not-so-healthy ingredients that are commonly found in popular energy drinks and shots that could have negative side effects and drug interactions. Since these are marketed as "herbal supplements" they are not regulated by the FDA which means they may not contain what the label says they contain or in the quantities stated on the label. Read more about this here– The Low-Down on High-Energy Drinks. Instead of spending your money on sugar-laden energy drinks, opt for a healthier pick-me-up which will also provide some extra nutrition and won't leave you with that crash and burn feeling or post-drink jitters. Chia seeds are packed with protein, fiber, healthy fats, B vitamins, and the minerals: calcium, iron, magnesium, manganese, phosphorous and zinc. They can be added to smoothies, oatmeal, yogurt, and even beverages for an extra boost of energy. Directions: mix 1/4 cup chia seeds in 1 cup of water, let stand until chia seeds form a gel (1-2 hours). Mix 1/4 cup of gel with 1 cup of your favorite 100% fruit juice– serves 4. If making a larger amount of the gel, store in the refrigerator and use within 3 days. Vitamin B12 is necessary for metabolism and proper functioning of the nervous system. It is found in animal products, eggs and dairy. If you are vegetarian or have certain health conditions, you may not be getting enough B12 in your diet. Some fortified cereals contain B12 as well as nutritional yeast (not to be confused with active yeast used in bread making). Check the label. Iron is essential for getting oxygen to your cells. Too little iron can leave you feeling fatigued. Incorporate vitamin C to aid in iron absorption. Plant-based sources of iron include beans, lentils, spinach and seeds. Directions: add 2 T of nutritional yeast fortified with B12 and a handful of spinach into your morning smoothies. You won't even know it's there! This mixture of fiber and protein will keep you feeling satisfied and energized whether you're at work or on-the-go. They are easy to make and taste amazing, too. Leave those sugary granola bars at the store and make your own healthier version! Directions: Mix together 1 cup old fashioned oats (dry), 1/2 cup almond butter, 1/2 cup raw coconut flakes, 1/4 cup ground flax seeds or hemp seeds, 1/3 cup honey, 1/2 cup chocolate chips, dried cranberries, or chopped nuts, 1 tsp vanilla extract. Makes ~20 balls, store in the refrigerator up to 1 week. Black and green tea contain caffeine but less than a cup of coffee. Black– 14-70 mg vs. Green– 24-45 mg. per 8-oz cup compared to 8 oz of brewed coffee which has between 95-200 mg.
Aside from the caffeine, tea also contains polyphenols which have anti-inflammatory and antioxidant properties. *Adolescents should consume no more than 100 mg of caffeine per day. This effervescent, fermented tea is full of probiotics, B vitamins and is growing in popularity. Consumers have reported benefits of improved digestions, alertness, mental clarity, better immune function and an overall good feeling. However, adverse reactions have also been reported such as upset stomach and allergic reactions so, as with any new food/drink product, do your research before buying. There are many brands to choose from and many different flavor options to suit your taste. Directions: Kombucha can be made at home but it is a scientific process and mistakes can lead to illness if not made properly. Please do your research before attempting this at home. Before you start spending money on energy drinks of any kind, drink a glass of water first and keep yourself hydrated throughout the day. Chances are you're feeling a bit sluggish due to dehydration which can zap your energy levels. As a general rule, divide your body weight in half and drink that many oz of water/day. Ex: someone that weighs 150 pounds should drink around 75 oz water/day.